The first comprehensive study of the nearly 100 extant species of mammals in Israel, including more than 175 full color paintings. For the scientist, this is an indispensable resource, featuring a full systematic list and taxonomic notes on some species. 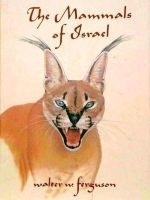 For the novice, this book is a fascinating exploration and spectacular visual celebration of the wildlife of Israel. Although Israel is a small country, it possesses a unique diversity of wildlife hosting early one hundred species of mammals unlike anywhere else in the world. This is the first comprehensive book to describe and illustrate in color all the species and races of mammals of Israel and will be helpful in their identification. The Mammals of Israel includes their habits, habitat, distribution and taxonomic remarks on the status of certain species and races. A resume of the wildlife of Israel introduces the reader to the mammals that inhabited the region in prehistoric times. It is hoped that in view of the danger to the survival of wild animals, this book will increase awareness of the wonderful wildlife heritage of Israel, enhance the appreciation and study of mammals, and help protect the mammals of the country for future generations. Walter W. Ferguson has contributed to the world of fine art, illustration, zoology and paleoanthropology. He has served as the staff artist for the Department of Zoology of the Tel Aviv University for 29 years. His book is a synthesis of two disciplines: art and science. Other books by the author include The Living Animals of Bible and The Snows of Mount Hermon. Full color illustrations. Album size .